The model LIGNUM is a functional-structural tree model, which simulates annual development of tree biomass and structure based on carbon balance (Perttunen et al., 1996; 1998; 2001). LIGNUM represents the tree architecture with simple structural units called tree segment, branching point and bud. The metabolic processes of the tree are associated directly to these elementary model building blocks. 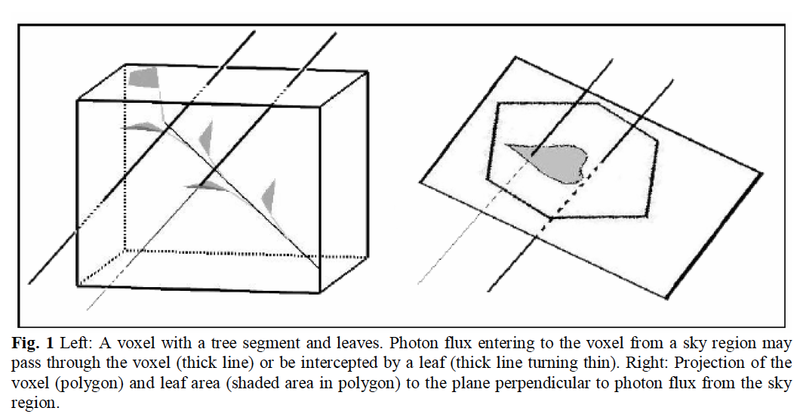 The model calculates the shading relationships between tree compartments within the 3D structure, and computes the annual interception of solar irradiance in each compartment. Intercepted irradiance is used for estimating leaf photosynthesis, and net primary production (NPP) is obtained by deducting the respiration losses in each tree compartment from the whole tree photosynthesis. Carbon allocation within the tree is estimated following the pipe model principles (Shinozaki et al., 1964), i.e. according to the relationships between the growth of foliage and water conducting and supporting organs - branches and stem - needed to support it. Tree structure is updated according to the carbon allocation. In this paper, we report application of LIGNUM model for simulating the growth and yield of eastern cottonwood (Populus deltoides Bart. ex. Marsh.) in a dense short-rotation plantation and a wide-spaced agroforestry system. In the cottonwood application of LIGNUM, there are also several new modelling developments including use of real weather data and a biochemically derived photosynthesis model (Le Roux et al., 1999; von Caemmerer and Farquhar, 1981). We also apply different time steps for physiological processes and structure update (Sievanen et al., this volume), and voxel space for estimating the interception of photon flux (Perttunen et al., this volume). M. Lu, P. Nygren, J. Perttunen, S. Pallardy, and K. Palaniappan. Growth simulation of eastern cottonwood (Populus deltoids) using LIGNUM model incorporating real weather data. 4th Int. Workshop on Functional-Structural Plant Models, 2004.